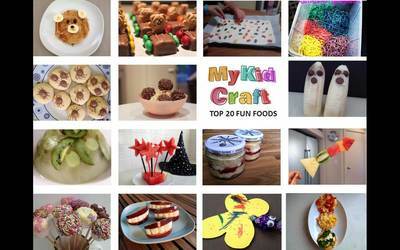 What better way to make eating fun than to involve kids in the creation and try something a little different. Why not try out some of these great ideas. Fun food is not just about cooking sweet biscuits and cakes. Fruit is colourful, sweet and packed with vitamins. I love this rocket ship that was created by Natasha Stewart and any budding astronaut would too. You could even try a blind fold fruit game to enjoy exploring new textures and tastes or create funny faces to brighten up a healthy snack time. Watermelon is easy to use as it's crunchy, juicy but holds it shape when cut. A few wizard wands can be created in next to no time. Teddy bear toast is a firm favourite in my house with two hungry boys. Jazz up a party table with some unsual fun food decorations and displays. One of the most popular articles on MyKidCraft are these Mars Bar Race Cars, perfect for a car themed party and traffic light pizzas would be great too. Chocolate balloon bowls and ice fruit bowls both make a unique display. Display some marshmallow party pops in a cup and they'll disapper quickly. If you'd like to make the food part of the fun then let the kids decorate their own cookies. Kids love to get cooking and their kitchen creations can make the perfect gifts for Mother's Day or other celebrations. Why not try Mars Bar crispy cakes, Valentine chocolates, a sweet butterfly or even try sending a birthday cake in a jar. Get into the spirit of big events like Easter, Christmas or Valentine's day. Easter bark is simple and effective or have a howling good time creating banana gouls, creepy crawly cookies and chattering teeth smiles for Halloween. Food doesn't just have to be for eating and it can be fun just to play with ingredients. When my son was younger, he was very taken with sensory pasta.